Downy Woodpecker checking out camera. 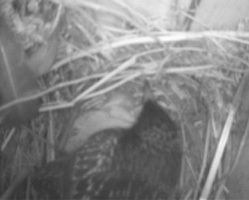 Starling in a GCFL box, working on its sloppy nest. Starlings are an aggressive invasive species, and should never be allowed to fledge young from a nestbox. A titmouse checking out the Gilwood box. g or picture in closed box.) The second (Sam's Wisecom) is dead, possibly because it's really an indoor camera. I have the remaining nestcam mounted in a Great-crested Flycatcher (GCFL) box on my chimney outside my office window. 03/20: starling activity has begun, mostly from 8-10:00 a.m. Starlings can not enter a regular bluebird nestbox, but the GCFL box has a larger entrance hole. I do not allow them to fledge young (since starlings are an invasive, alien species.) However, it is very interesting to watch them. They make the MOST bizarre noises inside the box, while puffing out their throat feathers, including whistles, clicks, sounds that are almost like a human voice, screams, and chimpanzee-like sounds. One bird makes a sort of CHOOOOOONK noise (somewhere between a truck horn honk and the sound my husband makes when blowing his nose) when defending the box. I assume they have a highly developed syrinx. As soon as one starling started going in, the fights began. Sometimes two birds are in the box at once and all hell breaks loose, with pecking and screeching. My indoor cat is enjoying Starling TV. 3/21. Linda Moore finds that most bluebird nest building activity is between 8-11 (see her blog with video clips.) The first starling showed up at 8:07 a.m. It was "cupping" even though there is no nesting material in the box. Since it was a balmy 18 degrees here in CT, I really was not expecting much activity. The starling has started bringing in nesting material like leaves. I noticed a bunch of them are now showing up at my backyard suet feeder. This is a cage style feeder, but is too narrow so starlings can get at some suet with their long beaks. 3/30: Just got back from a week of travel. Male bluebird checking out Gilwood. 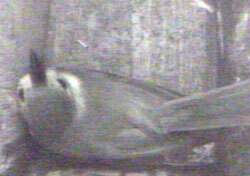 Saw a Black-capped Chickadee (BCCH) in the box for a few seconds at 11:23. I have also caught them on my birdcam checking out another box where they have nested in the past. They are quite secretive during nesting, so you will not see them perching on top of a box like a bluebird or House Sparrow. Starlings are gone, guess I trapped all the ones interested in the nestbox. 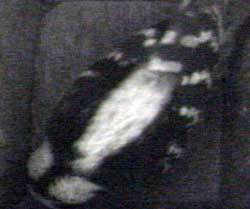 Having trouble with a new Sam's Club nestbox camera - picture goes too dark sometimes. A Downy Woodpecker spent several minutes inside the box, drilling away, and cranking out some woodchips. 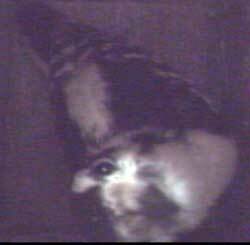 3/31: A new starling has showed up in the GCFL box. 04/7: Activity ground to a halt, probably due to cold nasty weather. Today starlings are interested in the box, with a female doing some cup molding motions, and addition of materials. As soon as one comes in, others approach. Nothing happening in the Gilwood box with camera, other than a male sitting on it occasionally. Ordered 10,000 mealworms - maybe if I start offering them, the blues will decide to nest. This new Sam's Club Wisecom camera is very disappointing - in the low light of the Gilwood it does not perform well, and sometimes goes almost completely black. Spot check by downy this morning. 4/8: Starling is rapidly filling up the GCFL box with a sloppy mess (deciduous leaves, cedar, feathers, straw, etc.) Has been pecking at the camera a bit. Some fights. I've heard starlings trying to cram their way into the Gilwood (the other box with a nestcam) but no such luck. 4/9: Starling adding more crap, doing a lot of cup molding. Sitting quietly in box for some time around 10:30. 4/15: Starling continues to work on nest, adding more crap, and cup molding. No egg yet. There is so much loose straw that it blocks the camera sometimes. No activity in the Gilwood box. I think the camera is spooking them, as that box was used by bluebirds for 3 years in a row. I plan to spray the nest with permethrin bird cage spray, as these nests often get bird mites and I don't want to take a chance that they will crawl up the camera cord into my office. A Tufted Titmouse checked out the Gilwood box for a few minutes. We moved the Gilwood camera to another NABS style box, as I really think it was not getting used because of the camera. Also, it's too dark in there, and the camera was not adjusting properly. 4/16: Tree Swallows are checking out the box we moved the cam too. 4/17: Smackdown! A more interesting, vocal starling came into the box and was hanging out, making weird sounds. A short while later, the original? nest builder came in and attacked. It grasped the other bird by the beak with its feet and would not let go. It had the vocal bird pinned and there was a lot of screaming. I pulled the box up and neither exited, so I grabbed them (still fighting) and both flew off. Wonder if either will return after their human encounter? Answer: A bird was back within minutes. I think it is the boring bird, as it didn't make any noises. Shortly thereafter, the noisier bird seemed to show up. It removed a chunk of nesting material. 04/27: A titmouse came by the GCFL box, and I am going away for two weeks, so I decided to remove the starling nest (which now has 4 eggs) to trap the starling.. I removed the nest (because it is so bulky it would interfere with trap trigger) and laid an egg on the floor and installed the Van Ert trap. The starling has been by multiplel times but will not enter the box. I trapped another starling in the PUMA Starling trap box, but left the nest in place on that one - probably should have left at least some nesting material. 4/28: finally trapped a starling (after adding nesting material with eggs) in the morning. Emptied box. Around 9:23, a House Wren quietly checked out the box, jumping right over the Van Ert trap I left in place in case more starlings came along.